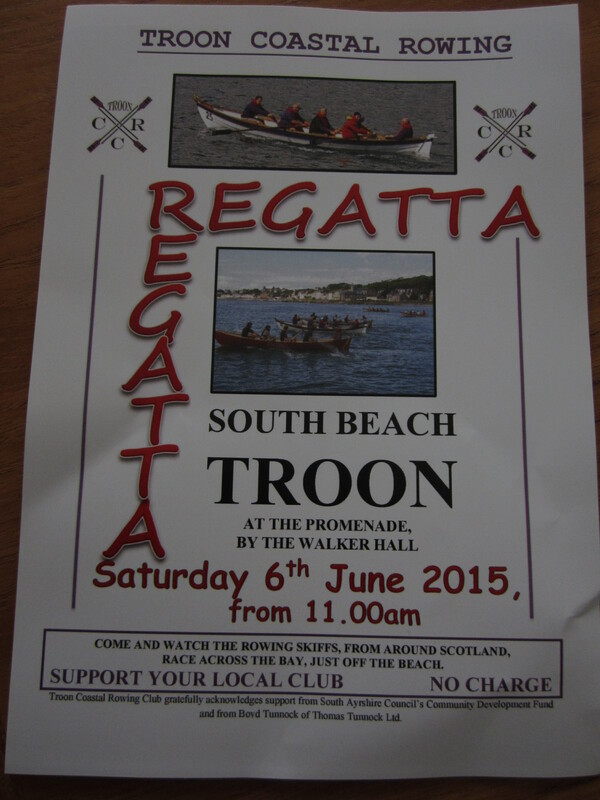 Troon Coastal Rowing Regatta takes place at South Beach area on Saturday 6 June 2015 from 10.30am throughout the day. There will be a total of 11 Skiffs taking part with teams from Anstruther, South Queensferry, North Berwick, Girvan, Maidens, Largs, Gourock and Cumbrae. Prestwick and Irvine, who are both quite new will be able to join along with our own two Skiffs, Ailsa Lass and Marr Voyager. There will be different distance races for various selections of crews with a series of sprints taking place offshore. This will be a colourful sight and we hope that Troon residents and visitors will come along to our Regatta. Prize giving will take place at the HQ tent at around 4.30pm.